Hello everyone, hope you have a nice weekend planned. 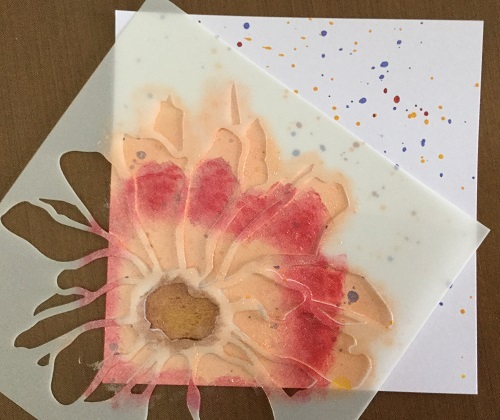 I have a very simple card to show you today, but it took a while to make due to drying time. I used the Daisy Large Flower stencil, Zinober Gold, Passion Flower & Red Starlights & Mixed Media Ink Sprays. 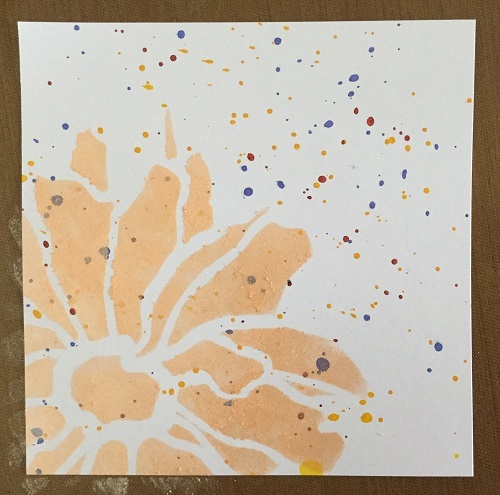 To make the splattery background I unscrewed the nozzle of each ink spray & flicked it over a square of white card, trying to get different sizes of splats. 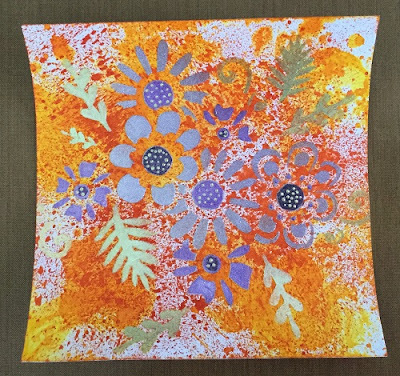 I used four colours; Sunshine, Red, Light Blue & Light Purple. 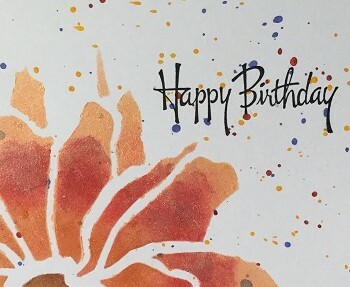 I didn't want any colour mixing, so I applied the colours one at a time, letting them air dry thoroughly in between, which is why it took so long to finish the card. I could have used my heat tool, but that tends to force colour into the card & I wanted the illusion that it was sitting on top. When the final colour was dry, I began applying Starlights, starting with a layer of Passion Flower as a base. Layers of Zinober Gold, Red & more Passion Flower were added to the petals & Topaz to the centre. 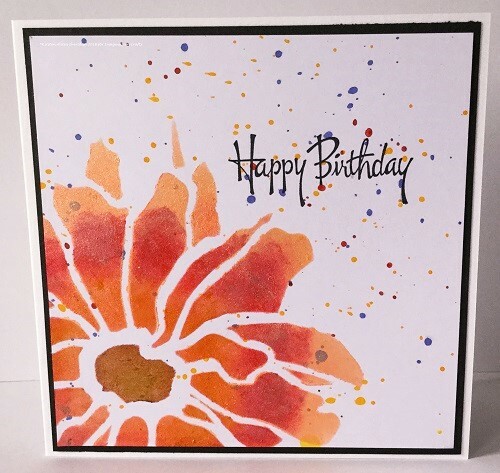 I added a greeting from my stash & layered the card on to black card & a 7x7 white card blank. That's it for today. There'll be another blog post in the next day or two, with information on our Hochanda shows, this coming Tuesday, August 16. 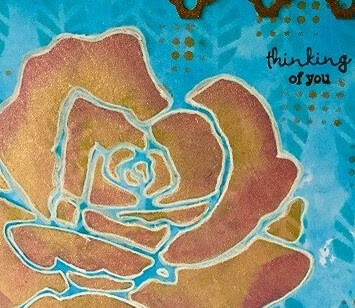 Mixed Media Ink Sprays, Starlights, new stencils & on this card, black Stencil Medium. I sprayed a square of white card with Yellow, Orange & Dark Orange MM ink sprays & left it to air dry - you can dry the ink with a heat tool, but I find you get a more intense colour if it's left to dry naturally. 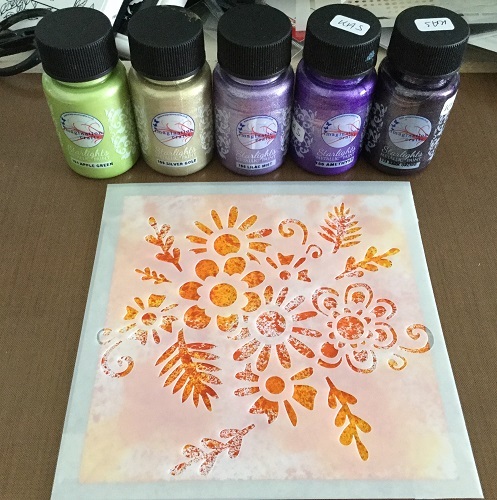 I chose my colours of Starlights - Menthol, Silver Gold, Lilac Mist, Amethyst, Dark Orchid - and used a small stencil brush to apply the paint through the Flower Bunch stencil. When the paint was dry I placed the Thank You stencil on top & applied black Stencil Medium through it with a JT3 palette knife, setting it aside to dry for a few hours. 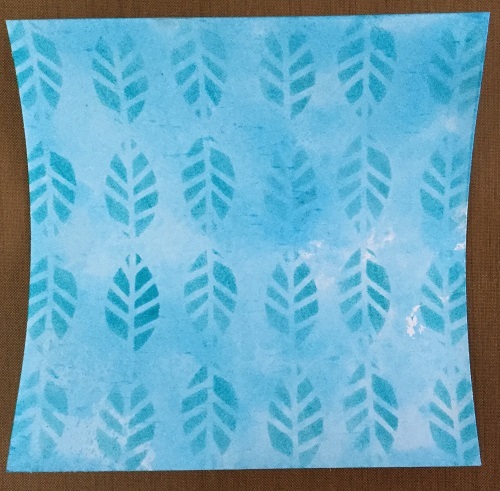 The stencil & card SPECIAL OFFER is still available on the website. Thank you to everyone who has purchased it so far, your orders are being dispatched as quickly as possible. Rose Large Flower stencil, Starlights & Mixed Media Ink Sprays. I chose Passion Flower & Pink Sunset for the rose, applying layers of colour & blending as I went. 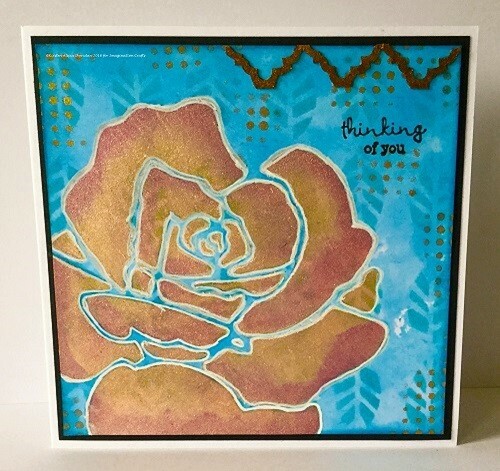 I applied Antique Gold Starlights through the tiny dots on the Grunge Elements stencil, went around the edges of the rose with a white pen & added a sentiment from my stash. 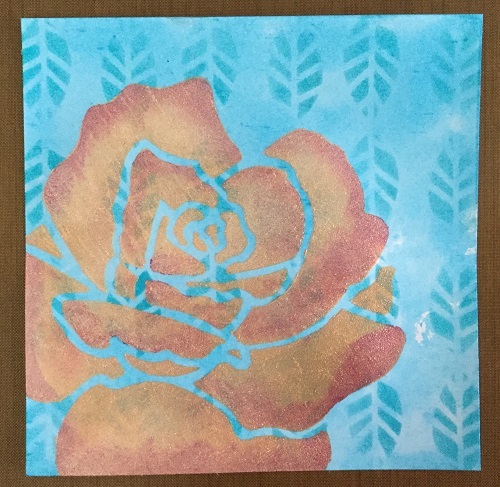 The stencil & card special offer is continuing on the website. Quantities are getting low, so don't miss out. Have a great week, I'll be back with more projects soon.